A video game made me cry. I cry at the drop of a hat these days; well; I feel like crying at the drop of a hat. But this game pulled me in and then kicked me in the feels. It’s called Fallout 4. You might have heard of it. But. Be warned. There be spoilers. Actually. Two video games made me cry. The one that really had the tears flowing — that didn’t just kick me in the feels, but headlocked me and threw me into some sort of MMA style submission hold — is an independent release called That Dragon, Cancer. Why did these games make me cry? 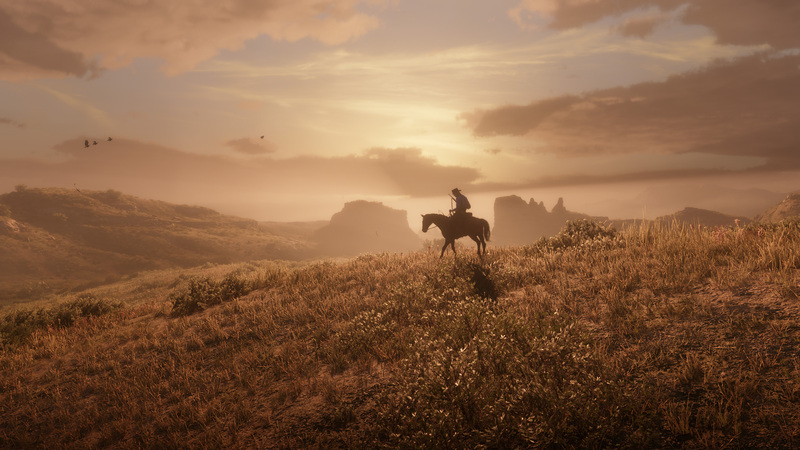 They have a couple of things in common — both games take place in beautifully rendered, coherent, worlds. These environments are the product of the sort of mythopoeic world-creation that’d have both C.S Lewis and J.R.R Tolkien feeling pretty excited about the capacity for video games to get us in touch with the enchanted reality we really live in. Both games rely heavily on story-telling; we’re carried along on a journey that pulls on the heart strings quite deliberately — even though Fallout 4 is in a sandboxy open world where you’ve got some freedom, while That Dragon, Cancer requires you to click your way from A to B in a very linear manner. Both games — and here’s the rub — hit me in the feels because of what they do with parenting, and loss. Though there’s also a stark difference here which made the impact of That Dragon, Cancer longer lasting for me; in that it is the real story of creator Ryan Green, and his wife Amy, and the loss of their beautiful son Joel. It’s an enchanting story because even amidst the clinical science and the very raw, real, emotions on display from the Green family, and others who’ve battled the dragon, there is a sense that Joel’s story plays out against a transcendent backdrop. This life, this cancer, is not all there is — it’s a dragon to be fought as part of a bigger, spiritual, narrative that is much bigger than simply the Greens versus a horrible and confronting bunch of aggressive cells. Fallout 4 is pure post-apocalyptic fiction told in a completely ‘immanent’ frame. There’s no real ‘enchantment’ here. Just the ability to explore and craft your way to recovery, building villages for survivors of the nuclear apocalypse while hunting for your abducted son, Shaun. Everything is very ‘tactile’ in a sort of digital way. You scrounge through debris looking for duct tape so that you can upgrade a weapon; you can salvage components from just about anything to use it to build your settlements or upgrade your mechanical armour. I can’t walk into Bunnings or the hardware aisle of a department store now without subliminally thinking ‘jackpot.’ Everything is subject to the laws of cause and effect, and you’re the author of your own destiny. You’re, as you play, in control of your story. The one spanner in the works is that it turns out Shaun was pulled from the grasp of your murdered wife a significant number of years before you’re cryogenically defrosted, many more than you thought, and he’s much older than you. He’s the game’s ‘father’ figure; and now the head of the potentially nefarious ‘Institute,’ the organisation responsible for his abduction and your wife’s death. What you do with this information, and with Shaun, changes the course of the game. My virtual self was convinced of the evils of The Institute, and pretty upset that Shaun wasn’t the little kid I’d been searching for; so I shot my son. For the greater good. My finger hovered over the trigger button for quite a while. This was the sort of ethical dilemma that video games now confront us with as they draw us into their worlds — into their ‘narrative frames’ — I shot ‘father’ because any relationship I thought I had with the character was based on lies. 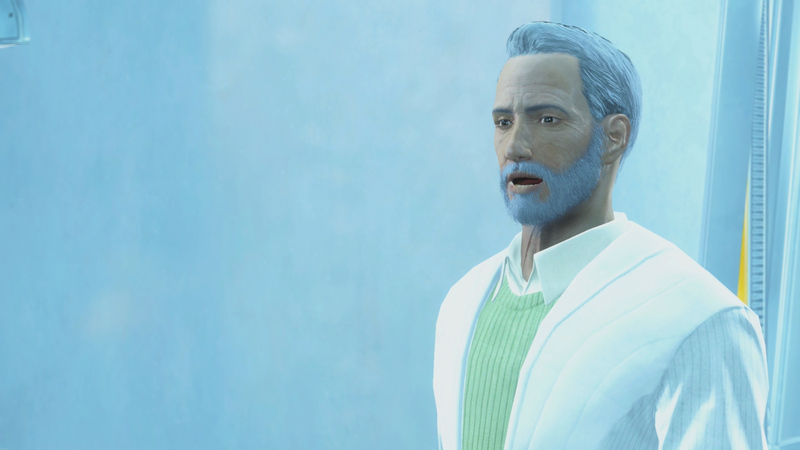 He was a manipulator, and his organisation was a threat to the better vision of the future that I was building in the Fallout 4 world. But I felt conflicted doing it. It helped that the Fallout world is both purely digital, with no real world crossover, and purely immanent — the consequences of my actions were going to change that world, but the flow on effects would only be in the chain of causality in the ‘immanent’ world, there was no cost to my digital soul because in the post-apocalyptic rubble there’s very little room for faith. Those of faith were members of strange post-doomsday doomsday cults. The landscape is littered with abandoned churches that at best are home to a few post-human irradiated ghouls. I wore a clerical robe for much of my time wandering through the landscape, but the hope I brought came from slaying mutant cockroaches and liberating civilians from the grasp of some over-sized mutants. With a custom-made automatic shotgun. Fallout’s world is our ‘disenchanted’ reality on steroids. This little paragraph from Dreyfuss and Kelly’s All Things Shining a philosophical treatise on the evacuation of ‘meaning’ and lustre from post-modern life, could easily describe the sort of world you inhabit as your character. There’s nothing remotely shiny — physical or metaphorical — about the Fallout world. Fallout didn’t end up teaching me much about myself; I enjoyed the scavenging and building of settlements for others more than I enjoyed picking which faction to side with in the bid for some sort of restorative revolution. I felt things about the loss of my son — while pursuing him — but when confronted with the reality, I made a very ‘immanent’ decision; one that benefited my digital minions and my wasteland idealism. One that fit my nobel cleric’s vision of the end times best. I just wanted my people to live another day… so when that happened, I was happy. Happy enough to hang up the shotgun, which I named THE DELIVERER, and start pottering around in my settlement with a robotic barman. That was Fallout 4. Perhaps the perfect story — or at least ‘a’ story — for the disenchanted ‘secular’ age; where transcendent questions are secondary. That Dragon, Cancer is the reverse. The ‘sciency’ immanent questions are very much the present reality, but there’s something bigger at play. A dragon that needs killing. A dragon we’d like to see killed, as fellow citizens of this world. If only cancer could be killed simply by understanding it. If only we could think it gone. 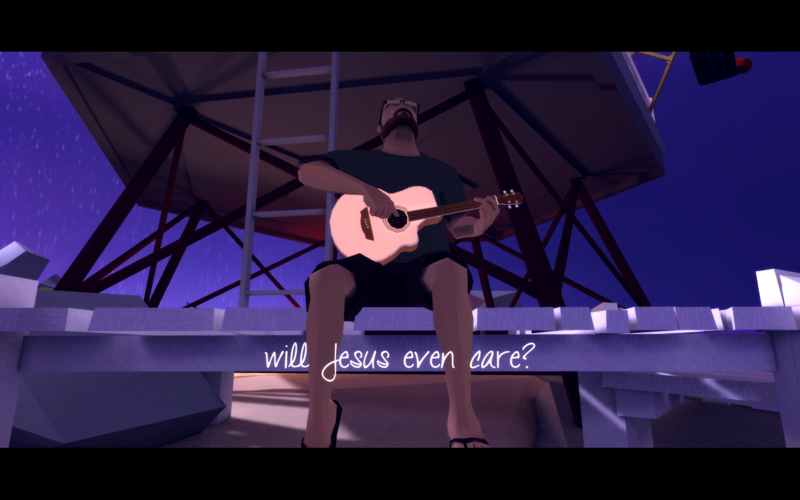 It’s unclear to me still whether That Dragon, Cancer has a happy ending. Joel dies. You know that from the beginning. From the marketing. You’ve got to be prepared to ride that rollercoaster with the family before investing yourself. Joel dies. And yet. He lives. 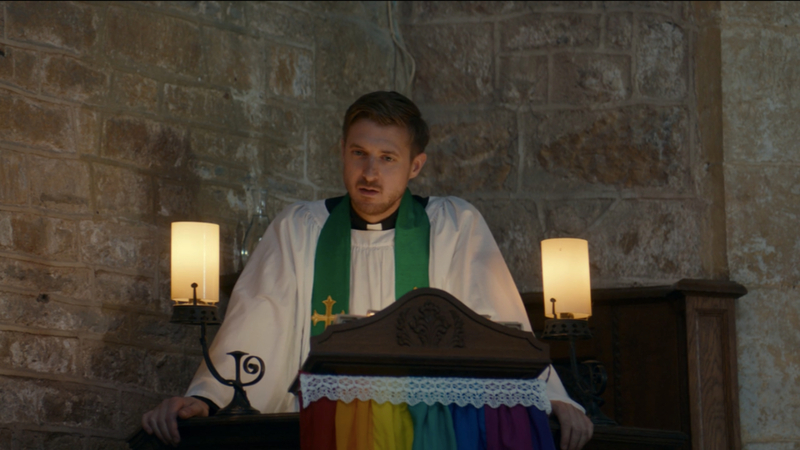 And not just in digital form — though it’s beautiful that Ryan and Amy were able to ‘incarnate’ and preserve Joel’s memory in the bits and bytes of his story in a lasting way. Joel lives because Joel’s family put their faith in Jesus. 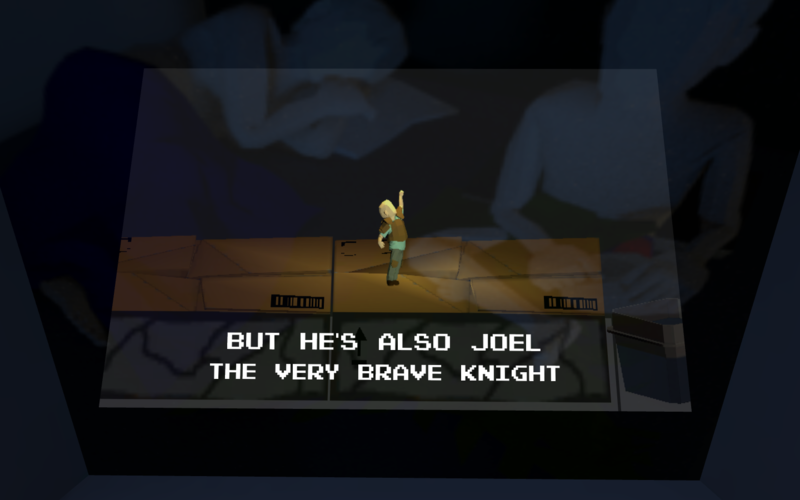 Joel lives, waiting for that time when Jesus returns to slay the dragon once and for all. Ryan and Amy ask those questions. And carry us with sensitivity and beauty and grace through their journey towards answering them. They don’t find all the answers, but they find reason to hope. They find meaning in faith — not just in the latin names of Joel’s dragon-like cells, or in the treatment. They find beauty in moments of pain, and things to be thankful for. They are amazing, and though they’re a world away I love them for it; and I long to spend at least some of my eternity with them and their pancake-loving son. Their story enchanted me. Here are some of the closing words from Amy to Ryan. I know I lost it at this point — I know it made me confront the ‘dragon’ and shake my fist at it, and its master death and Satan. I know it made me place more of my hope and trust in the one who will end the dragon’s grip on this world. We’re waiting, with Ryan and Amy, Joel’s parents. Waiting amidst pain. Waiting in longing. Waiting in hope. Waiting for that day when Joel’s ‘words’ at the end of the game become reality — “you made it too“… Waiting for our faith to become sight. And I’m glad they’ve shared some of their waiting with us, and all of their faith, and hope, and love for Joel, and their abiding trust in Jesus through the pain. I’m glad I ‘played’ my way through their story, and that my world was expanded by their experience — by Joel’s love for water, and ducks, and dogs, and pancakes, and by his family’s love for him. I love the final scene of the game — an imagination of reunion. Final reunion. A picture of Joel in the new creation. Cancer dead. Family restored. It’s more compelling than the reunion in Fallout, and ultimately, despite the multi-million dollar difference in budgets for rendering the world — and despite the pain being real — I’d rather live in Ryan and Amy’s world, which is more vivid and real, than in Fallout’s post-apocalyptic flatness and grey. I’d rather face these real questions — real pain, real mess, than that moment — real or virtual — of indecision about what preferred immanent solution I want to pursue with the pull of a lever, or a trigger, as I seek an effect I might cause. I’d rather live in an enchanted world than a disenchanted world where only ‘scientific’ questions have any bearing on the future of my family. I’d rather not feel like I’m in control — because I have no answer in the face of tragedy if I am. I can’t slay the dragons in this world on my own. So why does this matter? Why overthink video games — no matter how profound — in this way? Stories matter. The worlds our stories occupy matters. Because we’re shaped, profoundly, by story. Especially stories we participate in — which gives video games incredible power. This quote from James Smith could well be contrasting the approach to the world found in Fallout 4 and in That Dragon, Cancer. Fallout 4 and its world of things and control — even its ‘hauntedness’ — is set in a secular world. Even the disease — and the very visible scarring of people and ghouls — is the result of the nuclear apocalypse. That Dragon, Cancer presents us with the reality that the world is broken, and asks ‘is there more to this disease than we might grapple with via science’… these stories, these worlds, leave us with a very different understanding of ourselves, and our limits. My character in Fallout 4 was most definitely buffered — protected by his isolation, never getting too close to those in the settlements, separated from the world by my mech-suit, totally and symbolically insulated and isolated from the nuclear affects of the world. Even my pet dog was called ‘Dogmeat’ — perhaps to prevent any sort of attachment. Totally buffered. Totally autonomous. Totally in control — which is, ultimately, why I shot my son. Because I preferred my own ‘ordering’ of the world to his proposal, and wasn’t going to sign up. While the Greens, in That Dragon, Cancer couldn’t be buffered even if they tried. They didn’t just have to be completely open to some sort of transcendent blessing amidst their vulnerability, in making the game and consciously ‘unbuffering’ — both seeking contributions from other affected families, and involving ‘players’ like me in their story — they’ve remained vulnerable and connected. There’s a real path towards healing for them. Not in terms of tackling the dragon — Jesus will ultimately do that, and science might help along the way. The path to healing is one consistent with a transcendent world, and the picture of the enchanted, and enchanting, future we see in Revelation. What I’ve really learned in these games, as I’ve played, is that when you’re being beaten and buffeted about by what life in this world throws at you, an unbuffered self actually, counter-intuitively, has more to protect it than the buffered self. We aren’t in control. We need others. We need hope. We need transcendence. We need more than what ‘is’ in this material world. More than Dogmeat, or friendmeat. We need a dragon slayer.